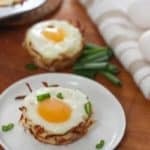 These yummy breakfast Egg Baskets have two ingredients! I love incorporating store bought ingredients that make a recipe so easy! In this case, store bought fresh hash browns do the trick! Cute little devils…arn’t they? Two ingredients – yup two! Pre-packaged fresh hash browns (like Simply Fresh) and eggs. Thats it! 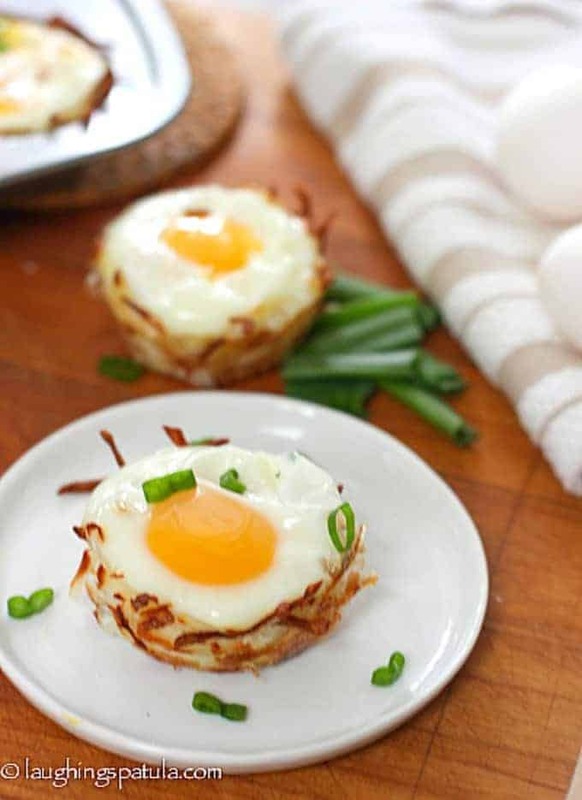 Bake the hash browns in a muffin tin, break an egg into the partially cooked potato cups. Put back in oven for the egg to cook and ta da! One package of fresh hash browns should yield about 6 muffins. You can add a piece of ham into the hash brown cup before cracking the egg into it if you would like. Really spray those muffin tins with non-stick. These guys want to stay in the pan. Careful not over-bake your eggs. 8-10 minutes should do it. Give them a little jiggle. You want the egg whites fully cooked and the center runny. Unless you prefer a more cooked egg, then give it another 3-4 minutes to completely set. Easy recipe and at only 145 calories a piece, you could have two! Looking for more easy brunch recipes? Check out this Blueberry Cream Cheese French Toast Casserole! or our Eggs Benedict Casserole! All the flavors of eggs beni that you love in one place! You can see all our Breakfast and Brunch recipes HERE! Simple 2 ingredient breakfast or brunch recipe! Start with shiny, light-colored muffin pans. For each egg basket, spoon about a 1/4 cup hash browns into a muffin cup coated with cooking spray. Press into bottom and up sides of muffin cup, pushing potatoes just above rim. Bake at 400° for 30 minutes. Remove from oven. Crack 1 large egg into each basket. Return to oven and bake at 400° for an additional 8-10 minutes or until eggs are set to your liking. 8-10 for runny eggs and 10-12 for firm. Let cool for a couple minutes and remove from muffin in with a rubber spatula. Sprinkle with salt and pepper to finish. How do you remove the cups from the muffin tins ??? Rubber spatula will work. They should slide out. As I noted, be sure to grease the muffin tins really good! The info at top says total cook time is 10 minutes. But you’re baking the hash browns for 30 minutes first, then baking the egg for 8-10 minutes more, right? Hi Marsha – My fault! I had a new recipe card installed last month and some of my older recipes didn’t convert properly. Thanks for the heads up…I’ll fix it! What a great idea. I usually make egg whites in my muffin pan but I will for sure give those cute eggs baskets a try. Btw I love hash browns from Traders Joes. They always come out great! 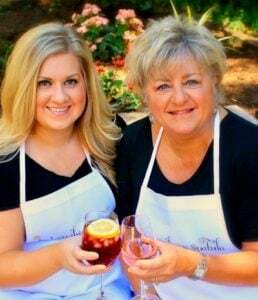 Thanks for a great post Kathi! This is so cute! What a perfect breakfast for easter morning. Get your easter basket, then eat eggs in a basket! Thanks Natalie! p.s. Can’t stop thinking about the fries on your blog and the dipping sauce…making them friday night! What a great idea, Kathi!. I’m loving the two ingredient idea. I always make things too complicated and I’m trying to think simple. Great post!